Note: See details for actual kit components. When it comes to gas and the gas appliances in your restaurant or institutional kitchen, what can be more important than safety? The reasons are obvious. In fact, you know you can’t afford to have your kitchen facility not meet the standards of applicable safety codes. So, when you need to connect your appliances to your gas supply, it only makes sense to use a blue hose gas connector, not only because of its excellent reputation, but more importantly because of its track record for safety, reliability, innovation, and performance. It’s no exaggeration to say that the blue hose is the gold standard in gas connectivity. It was the world’s first commercial kitchen gas connector, invented more than 40 years ago at Dormont Manufacturer, the company that led the development of the standard to which all foodservice gas connectors must comply. With millions of installations and counting, no other gas connector comes anywhere near the blue hose and its status as the preferred and specified product in food service. Today’s blue hose is the result of continuous improvement, with impressive design features unheard of when it was originally introduced. Features like tightly-woven stainless steel braid that prevents the corrugations from stretching when the gas equipment is moved. The heavy-duty stainless steel corrugated tubing gives the blue hose superb bending properties and extremely long life. Anti-microbial PVC coating for helping to prevent grease buildup and inhibit the growth of bacteria, mold, and mildew. A coating that won’t shrink, even in the high temperature environment behind kitchen gas equipment. And stress guard rotational and fittings that reduce stress at the connector ends, and even make it easier to install the blue hose. Because of these, and other features, the blue hose offers a host of benefits in addition to its safety, increased mobility, higher kitchen productivity, and cleaner kitchens. Did you know that the blue hose is made in Export, Pennsylvania? At a manufacturing facility right outside Pittsburgh, and that it carries a lifetime warranty? There’s another very important aspect of Dormont and blue hose gas connectors you should know about: the highly innovative gas connector accessories that when used with the blue hose make commercial kitchens even safer and more efficient and productive. Snapfast, the only one-handed, push-to-connect, quick disconnect available in the foodservice industry. Designed specifically for commercial kitchens, Snapfast makes moving gas equipment for cleaning and maintenance exceptionally easy, because only one hand is needed to reconnect it to the appliance. Plus, Snapfast includes a thermal shut off feature that automatically shuts of the gas when the internal temperature exceeds 350 degrees Fahrenheit. Dormont’s Swivel MAX multi-plane rotational device is another remarkable connector accessory designed by Dormont engineers. Use on either one end of the blue hose or both, this unique device gives the blue hose a full 360 degree range of motion. It reduces stress on the gas connector, makes moving appliances so much easier for cleaning and maintenance, and expands aisle space, because gas equipment can be moved closer to walls. The Swivel MAX is an excellent solution in situations where the gas manifold is situated in a low, or other non-ideal location. Another connector accessory exclusive to Dormont is the Safety Quik, a truly unique device that does the work of both a quick disconnect and a shut off valve. 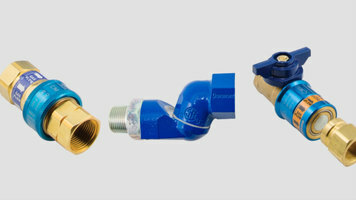 A cleverly designed all-in-one device, it prevents the gas connector from being disconnected until the valve handle is turned to shut off the valve, and it will not allow the valve to be opened until the blue hose is reconnected to Safety Quik. It also includes an automatic thermal shut off feature designed to activate between 250 and 300 degrees Fahrenheit. Dormont’s Safety-Set is a highly effective positioning system for returning caster-mounted equipment to its correct location after being moved for cleaning or maintenance. This is important because equipment needs to be positioned properly beneath fire suppression and kitchen ventilation systems. Safety-Set satisfies national fire protection codes 17-A and 96, which are being enforced increasingly throughout the country. Safety-Set will withstand up to 1000 pounds of crushed force, and unlike other positioning systems, it has an open floor design. That means that the caster wheels sit directly on the floor, not on any part of the positioning system, eliminating the need to re-level the appliance. Safety-Set accommodates 4”, 5”, and 6” casters. So when it comes to connecting your foodservice gas appliance, connect with confidence. Don’t take a risk, especially when you consider all that blue hose gas connectors offer, and especially consider the exceptional benefits you get, with Dormont connector accessories. Improve safety, productivity, efficiency, cleanliness, and space. Learn more about Dormont’s blue hose family of connectors and accessories, and its other numerous lines of foodservice products at Dormont.com. Improve your commercial kitchen’s safety by using Dormont’s blue hose gas connector for your gas appliances! To further increase your productivity and efficiency, try Dormont’s gas connector accessories such as the Snapfast, Safety Quik, and more! Can this hose be hooked up directly to an LP tank? No, this hose is designed to be hooked up to gas plumbing only, not portable tanks. How is the hose length measured on this item? The hose will be slightly shorter than the quoted length (24”, 36”, 48”, etc.) – the length given is indicative of approximately how long the connector will be when necessary connection hardware is added on to fit it to the equipment and your facility’s gas line. Some kits may include this hardware, while others may contain just the hose and assume you will be using this connection hardware from another source. Hook up your gas appliances and get cooking in a heartbeat with the Dormont 48" 16100KIT48 SnapFast® gas connector kit! This kit's SnapFast® device is a durable, one-handed quick disconnect that installs easily by attaching it to the appliance inlet and your blue hose. When it's time to clean your appliance, SnapFast® disconnects the gas flow for safe, easy maintenance, and then reconnects with just a push and a click. For added safety, SnapFast® has an internal thermal shutoff, designed to shut off gas flow when temperature inside the fitting exceeds 350 degrees Fahrenheit. The restraining device attaches securely to your equipment and the wall of your facility to decrease strain on your gas hose as you move your unit out from the wall for cleaning and maintenance. A restraining system is required in most commercial kitchens. 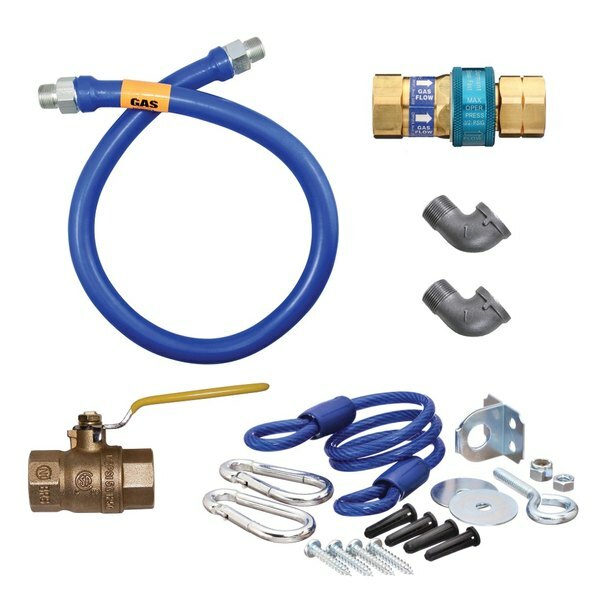 The Dormont blue gas hose included with this kit is made of woven corrugated 304 stainless steel tubing covered in an antimicrobial PVC coating that slows the growth of bacteria, mildew, and mold on the gas connector. The total length of the gas connector including hose and fittings is 48". Ordered 2 of these gas connectors for our range and fryer. Our propane guy who installed our equipment commented they are the standard, but found Webstaurant Store to have the best price. Dormont is the one of the best companies they make gas connector. It comes with all the attachment according to your need its very easy & safe . I purchased this product to connect a portable generator that I converted to run on natural gas, to a 1" natural gas line. I couldn't find this locally and many places online were very expensive. The price for this one was the lowest I found and it came with more stuff than the other options I saw. I received the product the very next day, even though I only paid for ground shipping. I inspected it as soon as I got it and it seems to be very high quality. The quick disconnect works well, and the extra parts such as elbows are nice to have. I would highly reccomend purchasing this product from this company. Wow, half the price of having to buy a quick connect locally. I'd buy these again in a heartbeat. I highly recommend them to anyone. This item is as described and fit the oven that we also purchased at the same time. It is a heavy duty hose and is well made. The qualiy of this hose surprised me in a pleasant way. The hose is very strong and has a tight flexibility to it, meaning that it bends, but isn't floppy. The connections were easily done and the directions were well explained.